In 2014, Weight Loss Options at Regional West Medical Center was recertified as a Bariatric Surgery Center of Excellence by the Surgical Review Corporation. 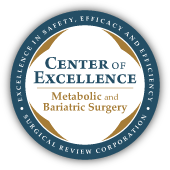 The Center of Excellence designation recognizes surgical programs with a demonstrated track record of favorable outcomes in bariatric surgery. Bariatric surgery is a procedure that reduces the size of the stomach, leading to significant loss of weight for those suffering from obesity. Severe obesity is closely associated with a number of serious conditions that undermine the health of overweight patients, including heart disease, high blood pressure, and diabetes. Bariatric surgery, when performed correctly, can help obese patients improve and possibly eliminate these conditions. Regional West Medical Center and Regional West Physicians Clinic-Surgery, Vascular Diagnostics of Scottsbluff began performing gastric bypass surgery in 1980 and laparoscopic bypass surgery in 2000. In 2001, Regional West became the first hospital in the region and one of only two hospitals (the other in Texas) west of the Mississippi River to perform lap-banding procedures. Since then, over 1,850 gastric band procedures have been performed at Regional West. The bariatric surgeons at Regional West ensure that a multidisciplinary approach is used when screening patients for bariatric surgery. The multidisciplinary teams include surgeons, nursing staff, the bariatric coordinator, dieticians, physical therapists, psychologists, respiratory therapists, and quality resource personnel. Surgeons with ASBS Center of Excellence designations practice only top-quality care, ensuring efficacy of the procedure with each patient to the best of their ability.